Look at that great fleece and curly head! 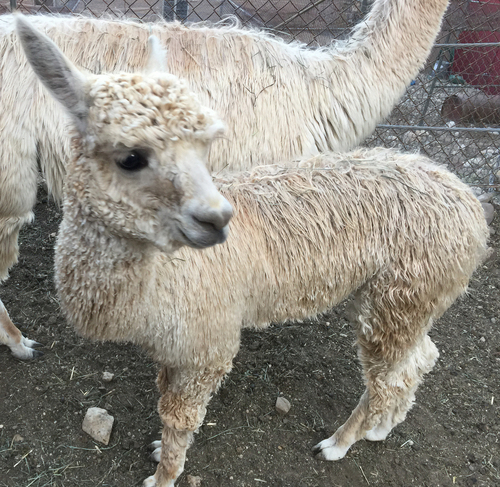 AWH Torbio's Rock'N Roll is a gorgeous light fawn with silky high luster fleece. He has an exceptional Accoyo pedigree, his sire was the famous Pperuvian Torbio and his dam is Rockstarlet. 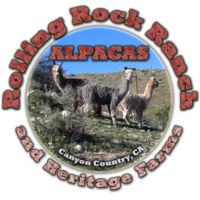 We are very excited to have Rocky in our breeding program. 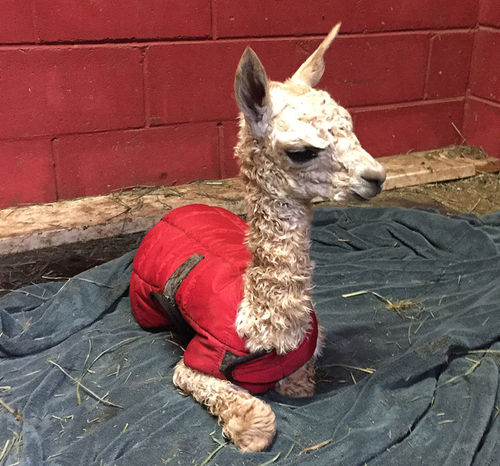 Rocky's first cria was born on Jan 2nd 2015 and is just gorgeous with a pearly luster and curls for days. Rocky has a very solid stature, but is easy to handle with a very gentle and curious disposition. 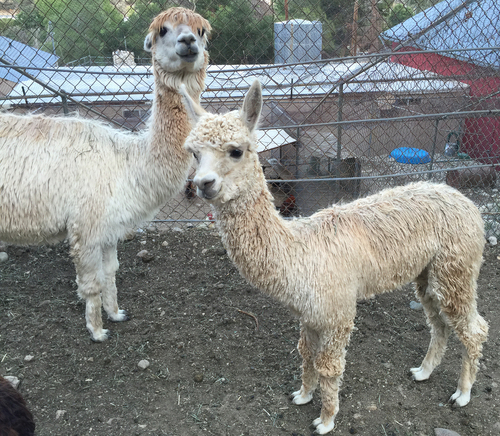 Sofia was our very first suri Alpaca. 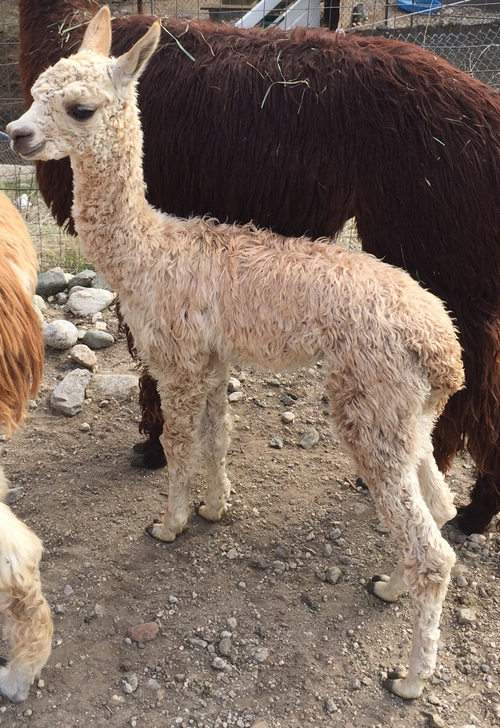 She came to us unproven, but had her first beautiful cria sired by our Rocky (Torbio's Rock N' Roll) on Jan 2, 2015. Little Jamie Lynn has great confirmation, pearly luster and nice looking locks. Sofia's lineage includes Milagro and Mahogany Prince. 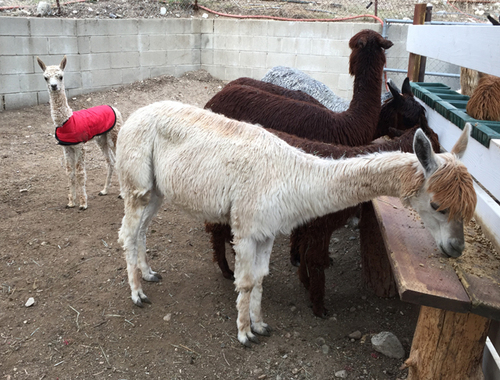 Sofia has proven to produce some really healthy crias that usually come a little early. El Nino is growing up to be a really solid boy. His confirmation has continued to be very good. Straight legs and nice flat back. He has extremely soft fiber that has slick handle, very good lock definition and luster for days. 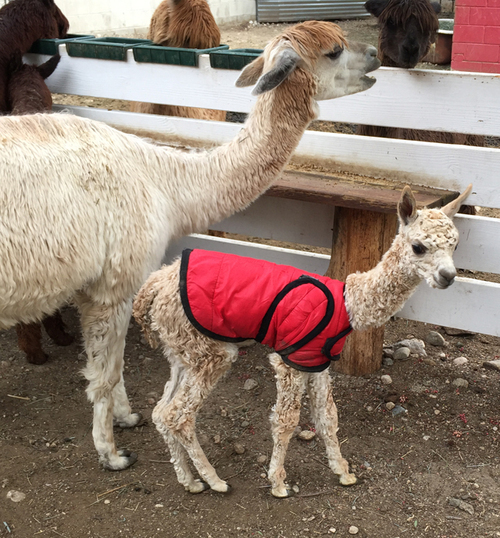 Sofia had her Jan 2016 cria on the first day that the rains hit here in SoCal from the El Nino weather that we are having this year. So of course we had to call him El Nino! Nino was 21lbs at birth. He is a big healthy boy that inherited that lovely soft Torbio fleece and curls that just don't end. Nino has it all... solid straight confirmation, strong and healthy, great fleece, Torbio and Mahogany Prince genetics and lots of confidence. After shearing we realized Mr. El Nino is really rather nice and we want to hang on to him and show him this next year before we make a decision on keeping him or selling him. I'm still leaving him up on the for sale list; we will still entertain offers on him, but I have removed his price as we are really not sure that we want to let go of him.